Hi, I’m Paweł. I hack on stuff and write about things. Last time we’ve seen each other, we’ve just deployed our Rails 5.1 API app. Time to put an end to this! A front end, of course. We’ll be using a Rails API backend which we’ve made in a previous series of posts, check it out! 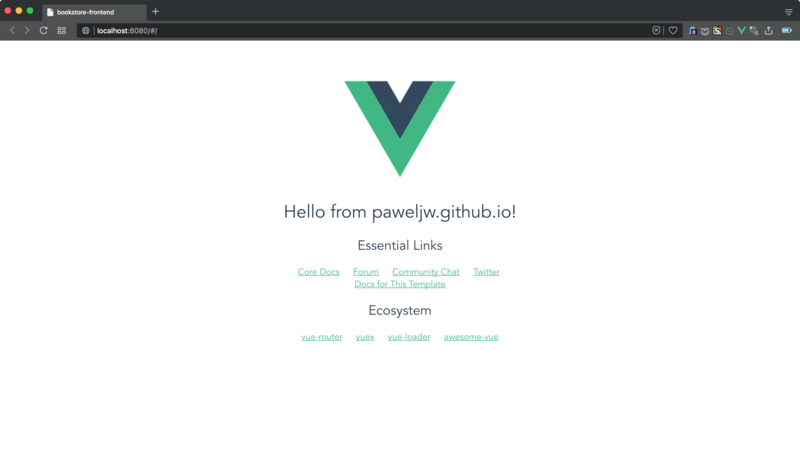 In this part we’ll go over the basics: how to get everything related to Vue.js installed, how to set up our app, and how the different bits and pieces fit together. This might seem like starting a step lower than my Rails series - and it is, since I’ve done a lot with Rails previously but I’m just starting with Vue. If you’re already a pro, this part might be safe to skip, and if you’re just starting like me - we’ll do it together! Many people have shown their support for this series by explaining some concepts to me, tweeting, opening issues and pull requests on GitHub - at this point the back end app really is ours, not just mine. Even more people have posted links to my articles all over the internet. While doing research for this new series, I’ve even stumbled upon a Stack Overflow answer linking back to my posts! In the past month since the first series ended, people have e-mailed me, tweeted at me, DMed me, posted comments on Disqus - basically contacted me in every way except slinging a letter-wrapped brick through my window - to ask when is the next part coming. I originally hoped to just keep on trucking right after the Rails series, but then offline life happened. Sorry. I’m amazed, overwhelmed and humbled by the response the Rails series got. From the bottom of my heart - thank you, everyone, for making all of this happen. You rock. Okay, okay. I’m done being emotional. Let’s get dangerous technical. Especially for modern languages, I like to keep my runtime versions separated. In my Ruby work this is actually a necessity - I’m frequently dealing with a lot of different projects which run on different interpreter versions. In about 90% of those the Ruby version cannot be bumped simply, whether because I cannot make such a decision single-handedly, or because the project priorities currently do not include allocating engineering time required to roll out new environments with updated Ruby. This is why for years I’ve been using RVM, though I’ve switched to rbenv in the past year or so. Naturally, when going into a new (for me) language I tend to sniff around the community and ecosystem for similar tools. The tool that does this with Node.js is called, somewhat unimaginatively, Node.js Version Manager, or NVM for short. This GitHub link has installation instructions. We’re going for the full Vue.js development experience. We’re going to be using ES2015 (a.k.a. ES6) - there’s no reason not to give ourselves all that import and class goodnes to play with. We’ll also want one-command bundling of all those files that we’ll make into one file that we can deploy, and tests, and… oh my, this is starting to look complicated, isn’t it. Thankfully we don’t need to bang out all that boilerplate code. There’s a tool called Vue.js CLI that’ll do most of that not-heavy-but-boring lifting for us. The CLI asks us a couple of questions - what the app name should be (again), some description and who’s the author. Then we get into some technical details. Do we want vue-router? Yes we do, and we’ll talk about the basics of it in a bit. Do we want to unit-test with Karma and Mocha? Of course we want to test! Do we want to test end-to-end with Nightwatch? You’ll notice that I’ve answered “No” here. I feel like end-to-end testing might be out of scope for this series, and if we want to revisit it in the future, we can easily add it ourselves later. The app is all generated now, so we can go ahead and install all the dependencies. Go get yourself something to drink - this’ll take a while on a fresh Node.js install (depending largely on your network speed, hard drive throughput and, ocasionally, current moon phase). Hold on, that's not a bookstore. Wait, so what’s showing this? I thought you’d never ask! Let’s look at the directory structure Vue.js CLI generated for us. *Hits Ctrl+C after 30s of scrolling* okay, just how many lines are you trying to print here, tree? Ruh roh, Shaggy. That’s a ton of files. Did the CLI really generate all those? Not really. Much like Bundler works in vendor mode, npm install directed NPM to download and store local copies of all the necessary packages in the node_modules folder within our app’s directory. Let’s just direct tree to skip all that. Phew! That’s much more manageable. But we can trim this down even further - the build and config directories are not of interest to us for now, we’ll get to those a bit later. Let’s drop those too. $ tree . -I "node_modules|build|config"
A README.md - this baby is GitHub-ready. An index.html which is used as the “HTML entry-point” of our app. This is the basic HTML template that our app gets loaded into when it’s built. If for some reason we decided to pull something from CDN, like Bootstrap, we could place the references in there. package*.json - built for and by NPM, we don’t need to touch those right now (but we will eventually). A static directory, where we could place static assets which we don’t need to reference from Vue.js. A test directory, where we can already see a spec for Hello. What’s that? We’ll see in a minute. And the main event of the evening: the src directory. Let’s take a closer look. main.js is the actual entry point for our Vue application. It imports Vue, App and the router, and mounts the Vue app to the HTML template in index.html. App.vue is what gets first loaded - it’s our base component. We also have a child component in Hello (so that’s what it was!). Components are the building blocks of a Vue.js application. They are used similarly to HTML tags in Vue.js templates. Each component has its own template (made by mixing HTML and Vue.js markup), its code and it can have a style, which can be scoped so that it only affects the particular component. Since we’re running the webpack scaffolding template, we’re set up to use “single-file templates”. These take the three parts mentioned above - template, code and style - and jam them into a single file with a .vue extension. Let’s take a peek at what our App component looks like. The three parts are clearly separated: the <template> at the top delimits our template’s code, the <script> contains the logic and <style> is just CSS. We should keep in mind that this component’s style is not scoped, so it will affect everything that is nested within App. In the script we can see that a component should export a default object. There’s not much in there, just a name. This is the name that components can be referenced in templates; if we were to nest App somewhere, we could say <app></app> in our template and it’d get embedded there. Since App is a top-level component, we don’t want to do it, but the name is required nonetheless. Looking at the template we notice that it is not congruent with what we see in our browser. There’s the logo, all right, but where’s all the text below? The answer lies in the <router-view> tag below. It does not look like regular HTML, so it must be a component. Also we did not define a component by that name (and we don’t see it anywhere in src). But we did use vue-router, so this is probably what provides this component. All that means that we need to dig into the router configuration now to unravel what is going on here. Since ./router.js does not exist, it follows that ./router/index.js is loaded here. Let’s take a peek. Even if we don’t know how everything here works, we can infer enough. So far, the routes only say “when path is /, load component Hello”. The name is for named routes, which are easy to link to - think of it like of path helpers in Rails. We’ll go over this in much more detail when laying out the routing structure for our app in a future episode. Okay, “load component Hello”. What’s in Hello? Jackpot. These are all the links we saw in the browser. But wait a minute - there’s no logo here! vue-router doesn’t just load a component - it loads the component into the <router-view> placeholder in a top level component. Whatever we define in App will always wrap what is in the component that router loaded - think of it like the application layout in Rails, and <router-view> as akin to yield in that layout. What does this component do? Nothing much, apparently - it does have its own scoped style and a single piece of data - msg - being displayed in the header. If there’s one nice feature about the development server that we’re running, it’s the live regeneration of the app views. If we change the <script> section of Hello.vue to say, e.g. When we were designing our Rails API app, we took a little bit of time before typing a single line of code to think about the reality we were trying to model and how to express it in code. That’s of course done now and we don’t need to do this again for the front end, at least not to the same extent. Vue applications are (largely) composed of components. Components are reusable and nestable. Therefore it seems pretty obvious that we can have our components as fine-grained, or as broad, as we would like them to be. It’ll be a fine balancing act to split them finely enough that they have a single responsibility each - identically to how we observe SRP in Ruby and other OOP. We’ll also need to keep ourselves in check to not split too much, lest we end up in infinite component tree hell. Of course we could just go ahead guns blazing, but then we’d just probably make a mess of things and simply cost ourselves more time than we saved on proper design. Therefore next time (in a week or two) we’ll take a bit of a breather from the code itself and spend a little time designing our app. In order to avoid wasting time later we’ll throw together a quick mock-up of the few screens we need and see how they can be cut neatly into components. We’ll also talk about the process of mocking up itself as well, such as what tools you can use (and why you don’t need any). Finally we will touch very lightly on some issues we can run into when dealing with UI and UX. As always, the code for this part is available on GitHub at paweljw/bookstore-frontend. Hey there! I hope you found the post above useful. If you feel it's worth it, and are capable of doing so, please consider buying me a beer through PayPal, or tweet @paweljwal if you want to grab one offline when you're in Kraków, MA, Poland. If you want to remove this text with your adblocker, the selector is #i-like-beer. In this final episode of the series, we’ll take a look at deploying our Single Page Application to Amazon Web Services Simple Storage Service (or S3). New year, new you blog post! In this long overdue part we’ll strengthen our command of loading data from the server and take a look at presenting it. Last time we built an authentication mechanism with a pretty glaring bug - you can just set the token in localStorage to whatever and it’ll let you in. We need to actually read the token, and persist what we’ve read so we don’t have to do it over and over. In this part we’ll allow the user to log in to our frontend app, using the auth mechanism we’ve built on the back end earlier. A lot of topics in this one, so jump right in! Now that we have our environment running, the app is initialized, and we know a little bit about what’s going on in there, it’s time to take a little bit of time to design our front end. Quick thing I threw together in about an hour: an IoT temperature and humidity meter! In this final part of our Rails API app series we’ll talk about specs, code coverage, continuous integration and deployment - and how to be certain your application is working. Time to deal with authenticating users in our bookstore application.